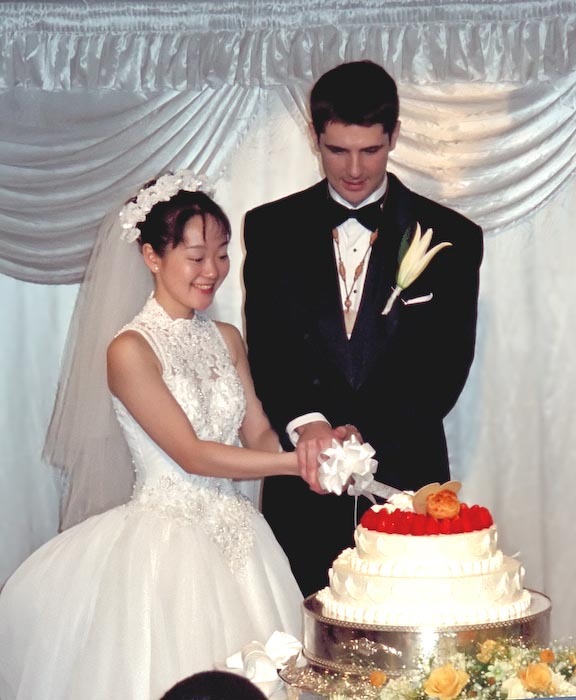 Today was our 10th wedding anniversary. It wasn't quite what I might have visualized 10 years ago – we were all pretty tired, and even normally robust Anthony was a bit under the weather – but Fumie and I got here together, and that's what it's all about. To answer the last question first, a sea bream is a fish that looks like the pie above. Fumie's mom chose an apple pie because the shop she went to (near where she grew up in another part of Kyoto) is well known for their apple pie. After having eaten it, I can understand why... it was absolutely fantastic. As to why the shape of a fish, well, it's a play on words. 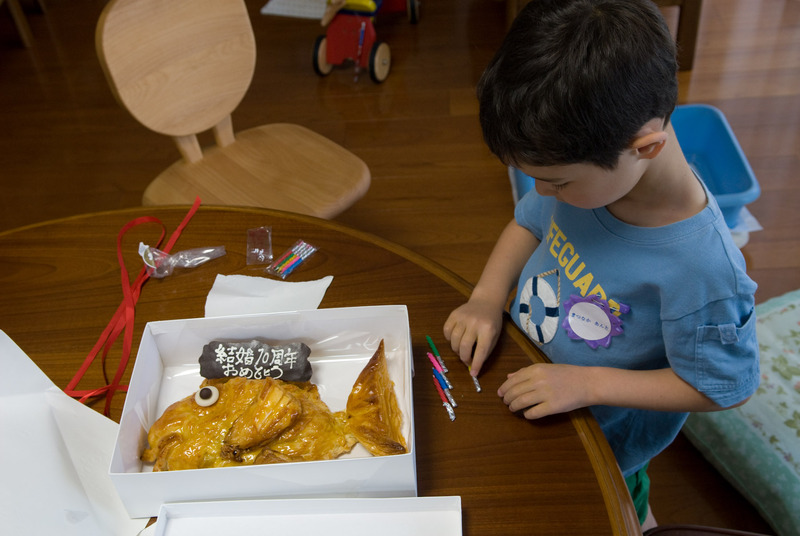 The name of the fish ( 鯛 – tai ) is pronounced the same as the ending of one form of the word “auspicious” ( お目出度い – omedetai ), and so in Japanese culture, the fish has somewhat become linked to auspicious events. In olden days when food was the greatest currency, one would give an actual fish. 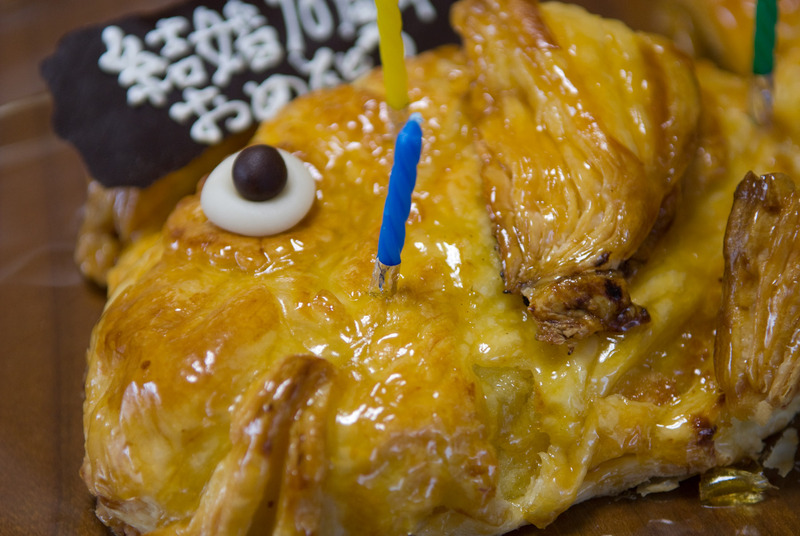 These days, fish-shaped sweets are sometimes seen. Fish-shaped apple pies are apparently quite rare. Thanks, mom! 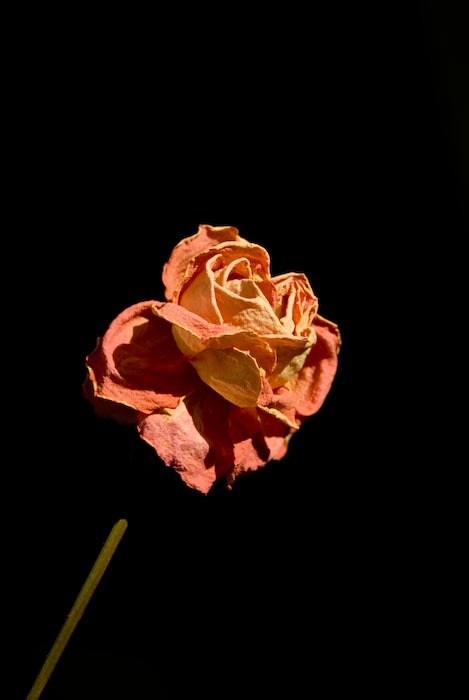 Looking around for things to take pictures of after having unboxed the camera, I didn't really know how to use it, but snapped this picture of a dried red rose sitting in a vase on the kitchen counter. I like how it came out. It was my sixth shot with the camera. I like how the foreground light totally overshadows the background, making it unseen. I wonder if this isn't some kind of metaphor for marriage (or any relationship), to concentrate on the bright foreground, not allowing subtle distractions in the background from, er, distracting you. Congratulations! Wow – 10 years already. And Fumie still looks just as young and pretty as she did in wedding photos. Congratulations, and thanks for the Japanese culture titbit about the fish. Love those little details. Congratulationsto you and Fumie-san! ! Have a nice 10th-year!! BTW – Love the photos you take. Congratulations, Jeffrey. Enjoyed the story about the fish. Hi! I love looking at your beautiful photos, and reading your posts. Not sure how I found your blog, but its always in my bookmark. Also, I think your son goes to the same youchien as I did many years ago ! Congratulations on your anniversary! That wedding picture is excellent. I hope someday i can have a sea bream pie too. Congrats Jeffrey. It is funny but my tenth anniversary was just 4 days before yours. 1998 was a good year! Best wishes to you.